Voted by the Christopher Ward Forum (CWF), a forum for CW enthusiasts, as the most significant new model introduction in 2014 by Christopher Ward London(CWL). "Few watch brands create their own movement and of those that do, only a handful add something really original and important to the world of watchmaking. Christopher Ward's in-house, Calibre SH21, which powers the C9 Harrison 5 Day Automatic is one such movement. Created by our master watchmaker, Johannes Jahnke, our new calibre, which is a certified chronometer by the Swiss Official Chronometer Testing Institute (COSC), can run under its own steam, once fully wound, for 120 hours/5 days. And here's the really clever bit; unlike most movements with such extended reserves of power there is no compromise in the stability or robustness of the movement which means the wearer can be confident that his watch will withstand even quite rugged conditions and require the minimum of servicing." 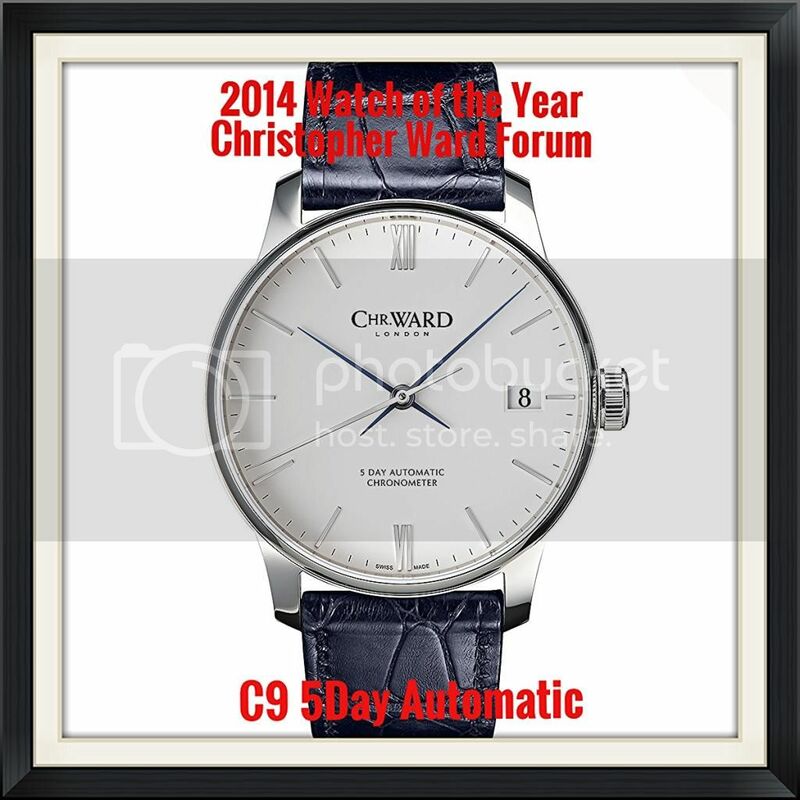 The C9 5 Day Automatic is an open series and may be ordered directly from Christopher Ward London. Initially not keen but ended the year as an owner. Amazing effort, especially considering the relative size of the company. Voted for the movement more so than the watch, which I'm sure was the thinking for a lot of people. A huge accomplishment. 2014 might have been the biggest year for the company yet. Hoping to see the SH21 in some new (and hopefully smaller) models in 2015 and beyond. bspj wrote: A close call? As far as we can see, looking at it by and large, taking one thing with another in terms of the average of voting, then in the final analysis it is probably true to say that at the end of the day, in general terms, you would probably find that, not to put too fine a point on it, there probably wasn't very much in it one way or the other. As far as one can see, at this stage. Yes, Minister. Seriously, much as I voted for the C5 Slimline, the C9 SH21 is an honourable winner of our vote. Given the brief from Kip I think this one wins comfortably. It will be interesting to see the next iteration of this movement. It's a lovely looking watch, but seems the movement is the main point of interest. It's one I'd like to see in the flesh (good excuse to make an appointment in Park St).